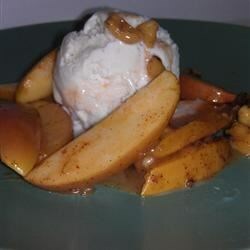 "Red apple slices baked in a caramel sauce with a hint of spice. Substitute cloves for cinnamon, if you like." Place sliced apples in shallow baking dish and cover with caramel sauce. Sprinkle with cinnamon. Bake in preheated oven 20 minutes, until just tender. I served this as a side dish with ham. Everyone loved it! Will make again over the holidays. Quick, easy and tasty. I used about a teaspoon of cinnamon. Used 2 Granny Smith and 1 red delicious, because thats all I had. Baking the apples is a nice twist to plain caramel apples. Good but not very exciting. Pretty yummy and easy. I put mine over vanilla ice cream and added walnuts.